The new BMW 6-Series Coupe heralds the arrival of an exceptionally sporty and exclusive 2+2-seater in the premium segment of top-class Coupes. The new model's extra length and width over its predecessor model combine with its 5-millimetre lower height to produce a strikingly low-set and powerful design. The new interpretation of the traditional BMW Coupe proportions is embellished by lines and surfaces inspired by the movement of waves. Flowing lines and harmonious curves create a feeling of athletic grace, complemented by extremely classy and eye-catching design features which underline the opulent character and elegant appearance of the two-door BMW. The expressive front end is dominated by the large and slightly forward-slanting BMW kidney grille. The grille emphasises the car's sporting pedigree with a broad, flat design, and creates a visual connection with the engine nestling behind. The kidney grille slats, angled slightly towards the top, lend additional emphasis to the front end's "shark nose" character. The contour lines of the bonnet converge towards the kidney grille, forming a V-shape which is continued by the contours of the headlights, kidney and wide air intake to give a road-focused look. High-quality chrome elements and the LED units of the optional foglamps positioned in front of them guide the eye to the muscular wheel arches. The new BMW 6-Series Coupe is equipped with bi-xenon headlights as standard. An accentuating trim element cuts across the top of the hallmark BMW twin round headlights to produce the intent look familiar from other BMW models. The optional Adaptive LED Headlights provide a fresh take on this established feature. The Adaptive LED Headlights for low beam and high beam contain LED light rings for the parking lights and daytime running lights, which are levelled off at the lower edge and overlapped at their top edge by an accent light - also featuring LEDs. The result is a stunning, distinctively BMW showcase for the innovative light technology below the surface. In addition, they also generate the low beam and high beam light from the two light rings. The light sources here are horizontal LED ribs positioned in the centre of the light rings. The brand's hallmark twin round headlight look is therefore expressed even more strikingly not only with the daytime running lights switched on, but also when the headlights are activated in the dark. However, the Adaptive LED Headlights are about more than just looking good; they also ensure the driver can see well. Their bright white light provides an intense and even illumination of the road ahead. From a colour perspective, the light comes much closer to natural daylight than that created by conventional halogen or xenon headlights, lending even reflective objects far greater contrast. The cornering element of the Adaptive LED Headlights is also tailored to the car's speed, steering angle and yaw rate, allowing the pivot of the headlights to adapt automatically to the line of the corner. Meanwhile, a light source positioned specially in the headlight housing generates the cornering light which, at low speeds, ensures illumination of the road surface in the direction the car is turning. LED technology is also deployed for the direction indicators, each of which consists of eight LED units arranged in a row underneath the light rings. As well as enhancing visibility in the dark, the Adaptive LED Headlights thus also significantly improve the signalling effect of the car's lights. Tightly curved surfaces and character lines stretching the full length of the body define the side view of the BMW 6-Series Coupe. The forward-slanting BMW kidney grille is particularly clear from this angle. Despite its smooth curves and innovative pedestrian protection measures, the long bonnet still has a flat appearance. Its contour lines fan out wide and extend towards the rear. In combination with the car's typical Coupe proportions, this creates a particularly elegant, elongated silhouette. The exterior design has been inspired by waves with clearly defined lines and volume formed around an object in flowing water. This gives the new BMW 6-Series Coupe a naturally powerful and sporty edge. The typical BMW swage line extends out from behind the front wheel arch, takes in the sporty gill feature and extends dynamically along the flank of the car to the rear. In so doing, it stretches the new BMW 6-Series Coupe visually and lends it a dynamic yet elegant allure. The door handles are integrated precisely into the swage line. A further character line emerges from the swell of the front wheel arch, before dropping down between the gill and the door and then levelling out towards the rear, its path replicating a forward-surging wave. The door sill line underneath it and an additional crease give the lower edge of the body a light and sporty appearance. The roofline of the new BMW 6-Series Coupe also swoops in an elegant, flat progression into the tail. It comes across as especially svelte when viewed from the side, creating a contrast typical of BMW Coupes between the powerful body and light passenger compartment. Doors with frameless windows underline this impression. The chromed side window border emphasises the "counter-swing" at the foot of the C-pillar (known as the Hofmeister kink) with its particularly tight line. From the rear, the new BMW 6-Series Coupe exudes power, athleticism and solidity. Bulging wheel arches accentuate the wide track of the new car, offering a hint of its impressive roadholding. Added to which, horizontal lines and the broadening impression of the car's shape as you follow it towards the rear paint a clear picture of the sporting performance waiting to be unlocked. The slightly concave lower section of the boot lid generates light and shade effects which lend an extra lightness to the rear of the car. The edges of the boot lid and the licence plate surround create a V-shape, which - similarly to the front of the car - steers the eye towards the road. The exhaust tailpipes are positioned on either side of a diffusor-style apron. On the BMW 650i Coupe they are trapezoidal in shape while on the BMW 640i Coupe they are circular. The two-part rear light clusters display the customary BMW L-shape in a particularly wide rendition that extends far into the boot lid, while the swage line that flows into the rear lights forges a harmonious link between the side and the rear of the car. Inside the rear light clusters, two LED-powered light strips generate the familiar BMW night-time look, an effect that is reinforced by the L-shaped lower light unit. The direction indicators and brake lights are also LED-powered. The wide additional brake light is located in the upper edge of the boot lid. The driver-oriented cockpit layout familiar from BMW models down the years and a dynamic forward-surging movement define the design of the interior. The centre section of the instrument panel - including the Control Display, the central air vent and the controls for the audio system and climate control - is angled slightly towards the driver. The gearshift lever is located on a surface that opens out towards the driver and is set lower than the front passenger side of the centre console. This structure is repeated in the central section of the instrument panel, further enhancing the driver-focused feel. The fluent transition between the centre console and instrument panel can be accentuated with optional stitching in contrasting colour for the leather surfaces. The horizontal structuring of the instrument panel is accentuated by an electroplated strip on the driver's side of the cabin. This is extended into the front-passenger side in the form of a subtle crease in the glove compartment. Meanwhile, powerfully taut waistline surfaces - which are carried forward into the instrument panel - embody the feeling of dynamic forward movement inside the cabin. The decorative surface of the instrument panel extends into the centre console with an elegant, slightly curving sweep to lend the front-passenger side an exclusive allure. The rear seats also provide their passengers with a very pleasant level of touring comfort thanks to their individual-seat character and greater shoulder and elbowroom compared with the outgoing model. In addition, there is also more headroom for all the passengers, despite the reduced overall height of the car. The rear seat backrests can be specified as an option with a through-loading facility for a ski bag, allowing two pairs of skis to be transported in comfort. The luggage area can accommodate 460 litres (16.24 cu. ft) of luggage, which means that the BMW 6-Series Coupe can carry three 46-inch golf bags or two medium-sized hard-shell cases plus a flight case. One V8 and one six-cylinder in-line engine are available for the new BMW 6-Series Coupe from market launch, and both can claim unique features. These power units are kitted out with BMW TwinPower Turbo technology, including High Precision Injection petrol direct injection, and stand out with their instantaneous power development, majestic in-gear acceleration, outstanding refinement and exemplary efficiency for their output class. The eight-cylinder power unit in the new BMW 650i Coupe produces maximum output of 300 kW/407 hp from its 4.4-litre displacement between 5,500 and 6,400 rpm. This unique engine, whose turbochargers are positioned in the V-shaped area between the cylinder banks, produces an instantaneous and sustained wave of power, making it a feast for the enthusiast driver. Peak torque of 600 Newton metres (443 lb-ft) is served up between 1,750 and 4,500 rpm. The sporting performance attributes of the V8 engine enable the new BMW 650i Coupe to accelerate from 0 to 100 km/h (62 mph) in 4.9 seconds, leaving the engine electronics to call a halt to proceedings at 250 km/h (155 mph). And yet the range-topping model also demonstrates extraordinary efficiency for this output class, recording average fuel consumption of 10.4 litres per 100 kilometres (27.2 mpg imp) in the EU test cycle, together with CO2 emissions of 243 grams per kilometre. The new BMW 640i Coupe is powered by a six-cylinder in-line engine in which the BMW TwinPower Turbo technology brings both direct injection and VALVETRONIC fully variable valve control to the table. This combination optimises both the responsiveness and efficiency of the 3.0-litre powerplant, which generates maximum output of 235 kW/320 hp at 5,800 rpm and puts its peak torque of 450 Newton metres (332 lb-ft) on tap between 1,300 and 4,500 rpm. The BMW 640i Coupe completes the sprint from rest to 100 km/h (62 mph) in 5.4 seconds, and its top speed is electronically limited to 250 km/h (155 mph). Average fuel consumption in the EU test cycle stands at 7.7 litres per 100 kilometres (36.7 mpg imp), while CO2 emissions come in at 179 grams per kilometre. Standard-fitted eight-speed Sports automatic gearbox with steering wheel shift paddles; BMW 640i Coupe with Auto Start-Stop function. Both the BMW 650i Coupe and BMW 640i Coupe transfer their power to the rear wheels via an eight-speed Sports automatic gearbox. This standard-fitted unit enhances sporty driving with exceptionally rapid gear changes, offers outstanding shift comfort and also optimises the efficiency of both model variants. The innovative gear set configuration of the compact, low-weight automatic allows it to offer eight gears and a correspondingly wide gear spread. This not only enhances the car's sprinting ability, but also supports economical driving at low revs. With its minimal converter slip and impressive inherent efficiency, the eight-speed Sports automatic helps to ensure efficient power transmission. And the driver can also change gear manually using the shift paddles mounted on the steering wheel. Extensive BMW EfficientDynamics technology also plays its part in cutting fuel consumption and emissions in the new BMW 6-Series Coupe. Among the systems fitted as standard are Brake Energy Regeneration, Electric Power Steering (EPS), the on-demand operation of ancillary components, intelligent lightweight construction and low-rolling-resistance tyres. The new BMW 640i Coupe is also fitted with automatic active air flap control and the Auto Start-Stop function. When the driver draws to a standstill at junctions or in a traffic jam, the engine is automatically switched off to prevent unnecessary fuel consumption at idle. As soon as the driver releases the brake pedal, the engine starts up again. If the driver is using the Auto Hold function, the engine is restarted when the accelerator is depressed. Another innovation also helps smooth the way to particularly low fuel consumption while on the move. A touch of the Drive Dynamic Control button allows BMW 640i Coupe drivers to activate ECO PRO mode and unlock additional efficiency-boosting potential. ECO PRO mode tweaks the engine management, the accelerator mapping and the shift characteristics of the automatic gearbox to favour a consciously relaxed and frugal driving style at low engine revs. At the same time, efficient power usage for electrically operated functions such as the climate control system and the seat and exterior mirror heating ensures extremely efficient in-car energy management. Special readouts in the instrument cluster and Control Display keep the driver informed on the levels of energy efficiency currently being achieved, as well as keeping a record for the journey up to that point, and encourage a driving style that minimises fuel consumption. For example, the increase in range achieved by using ECO PRO mode is shown in kilometres. The driving experience in the new BMW 6-Series Coupe is defined by sporty handling characteristics. However, the cutting-edge chassis technology of the two-door car also delivers impressive ride comfort. Both the double wishbone front axle and the integral rear axle are made predominantly from aluminium. The chassis set-up is geared to the requirements of drivers with sporting intentions, although the dampers also respond sensitively to bumps in the road surface under high lateral acceleration. Available as options for both model variants are Dynamic Damper Control and the Adaptive Drive system, which also includes Dynamic Drive active roll stabilisation. The electronically controlled dampers adapt to both the nature of the road surface and the driver's style to prevent unwanted movements in the car body, while an innovative damping system adjusts the compression and rebound settings continuously and independently from one another. For example, a stiff chassis setting can be impressively combined with comfortable responses to unevenness in the road surface. The roll stabilisation feature also reduces effects such as body roll in high-speed corners and under sudden changes in direction. The Electric Power Steering system with Servotronic function delivering speed-sensitive power assistance is unique in the BMW 6-Series Coupe segment and combines customary BMW precision, comfort and efficiency. In contrast to conventional mechanical/hydraulic systems, the power assistance is provided by an electric motor, which only goes to work - and therefore uses energy - if power assistance is required or desired by the driver. In addition, the new BMW 6-Series Coupe is the first car in its class that can be ordered, as an option, with Integral Active Steering. This system combines the Active Steering system for the front axle - already available for the predecessor model - with a steering rear axle, allowing the steering angle and power assistance to be controlled at both the front and the rear with the help of electric motors. Precisely harmonised wheel deflections pave the way for extraordinary agility in dynamic driving situations. Also, Integral Active Steering displays an impressively deft touch around twisty mountain passes and in city traffic. At speeds of up to 60 km/h (37 mph), the rear wheels are turned in the opposite direction to the steering angle of the front wheels. This has the effect of reducing the car's turning circle and the amount of steering effort required. At higher speeds, Integral Active Steering gives the car extremely comfortable and assured reactions when changing lanes and cornering. The rear wheels follow the same steering movements as the front wheels, enabling the car to follow the course set by the driver with even greater immediacy and precision. With Drive Dynamic Control, the virtues of sportiness and comfort can take precedence as the situation demands. Drivers can make their own choice of suspension settings in NORMAL, SPORT and SPORT+ modes using a button on the centre console. In the new BMW 640i Coupe, ECO PRO mode can also be activated. If the Dynamic Damper Control or Adaptive Drive option has been specified, the COMFORT setting can also be used. In this mode, as well as adjusting the accelerator pedal progression, engine responses, power steering characteristics, DSC response thresholds and the shift dynamics of the automatic gearbox, Drive Dynamic Control also tweaks the damper responses and, if necessary, the roll stabilisation settings. On cars also fitted with Integral Active Steering, the basic steering set-up is also adjusted according to the mode selected, as well as the level of power assistance. As a result, in SPORT and SPORT+ modes the car's sporting responses are sharpened even further. The lightweight, floating-calliper brakes with inner-vented discs are easy to use with precision, and their effectiveness is reinforced by Dynamic Stability Control (DSC). This driving stability system brings together technology such as the anti-lock braking system (ABS), Dynamic Traction Control (DTC), Cornering Brake Control (CBC), Dynamic Brake Control (DBC), the Start-Off Assistant, the automatic Brake Drying function and brake fade compensation. Standard equipment also includes 18-inch light-alloy wheels on the new BMW 650i Coupe or 17-inch rims for the new BMW 640i Coupe, as well as runflat tyres and a runflat indicator. The selection of driver assistance systems and mobility services available from BMW ConnectedDrive for the new BMW 6-Series Coupe is even broader than that enjoyed by its predecessor. These systems and services enable the intelligent link-up of the driver and car with the outside world, enhancing both comfort and safety and the use of the car's infotainment features. Among the options largely unmatched in this vehicle category are the Lane Change Warning System, Lane Departure Warning System, Speed Limit Info, BMW Night Vision with pedestrian recognition, the rear-view camera, Surround View and the BMW Parking Assistant. Innovative technologies optimise the integration of the Apple iPhone and other smartphones, as well as music players. And, in addition to internet access, BMW ConnectedDrive also allows email messages received on a smartphone to be shown on the Control Display, as well as the use of internet-based services for navigation and entertainment. Other functions not offered by the new Coupe's rivals include the location-based telephone information service from BMW Assist and the Advanced Emergency Call function with automatic vehicle location and accident severity detection. The optional BMW Head-Up Display - which projects important information onto the windscreen, directly in the driver's line of sight - remains the only system of its kind in the segment. 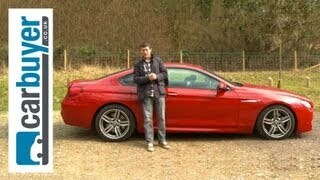 And the latest generation of this BMW innovation is now available in the new BMW 6-Series Coupe. For the first time, a full spectrum of colours is used to display graphics and symbols, making road sign symbols, for example, impressively realistic. At the same time, the Head-Up Display is now able to present a wider range of information. Depending on vehicle specification, the following can be shown in the Head-Up Display: High Guiding function information supplied by the navigation system, information from the Speed Limit Info system, Check/Control messages, status messages from the Lane Departure Warning System and warnings from the BMW Night Vision system. The standard-fitted comfort-enhancing features on board the new BMW 6-Series Coupe include 2-zone climate control, a multifunction steering wheel, electric steering column adjustment, electrically adjustable and heated exterior mirrors, Cruise Control with braking function, a rain sensor with integrated automatic driving lights control, and a HiFi audio system complete with nine speakers, MP3-compatible CD drive and AUX-IN connection. Meanwhile, technology such as a DVD changer, TV module, DAB (Digital Audio Broadcasting) receiver and USB audio interface allows passengers to enjoy their personal choice of on-board entertainment. When it comes to delivering audio pleasure of the highest order, the Bang & Olufsen High-End Surround Sound System designed especially for the new BMW 6-Series Coupe hits all the right notes. Jointly developed by the Danish audio specialists and BMW, this system produces an exceptionally natural sound from 16 speakers distributed around the cabin. It is a fully active system featuring digital signal processing, which means the two bass speakers, seven mid-range speakers and seven tweeters all have individual amplifiers. This technology enables the targeted modification of any sound reflections inside the vehicle. The Bang & Olufsen High-End Surround Sound System uses Di-rac Dimensions™ technology to recreate the acoustics of a reference listening room in the passenger compartment. All vehicle occupants therefore enjoy the same high-quality sound stage wherever they are sitting. The electrical signals are converted into precisely defined sound waves using neodymium magnet drivers, and the mid-range speakers feature extremely stiff Hexacone diaphragms. The outstanding quality of the Bang & Olufsen High-End Surround Sound System is underlined by exclusive design features. The form and colour of the advanced all-aluminium speaker grilles have been tailored precisely to the interior design of the new BMW 6-Series Coupe. The special perforation pattern of the grilles is created using a very sophisticated drilling technique. The grille mounts are not visible from the outside, ensuring that the grilles stand out from their surroundings by appearing to float in a slightly raised position above the surface. This exclusive ambience is further enhanced by a discreet lighting effect, which showcases the contours of the sound sources with a subtly impressive effect. A both visually and acoustically significant innovation, meanwhile, is the novel design of the centre speaker in the instrument panel area, which uses Acoustic Lens Technology developed by Bang & Olufsen to provide a particularly harmonious sound. As soon as the audio system is activated, the central element containing the integrated mid-range speaker pops up, prompting the tweeter lens to be extended at the same time. The tweeter lens distributes its signals evenly at 180 degrees throughout the interior. This extraordinarily harmonious horizontal dispersion of sound is achieved through the special design of the lens, which also minimises unwanted vertical sound dispersion. Among the other highlights on the options list are Adaptive Headlights, a heated steering wheel, Comfort Access and the electrically operated panoramic sunroof with tilt function, whose glass cover - with a clear surface spanning 806 x 578 millimetres - spreads across almost the full width of the car. The optional Navigation system Professional, featuring a hard disk for storing maps and personal music collections, uses the high-resolution graphics of the Control Display to give a particularly detailed overview of the region the car is currently travelling through. As an alternative to the map display in full-screen mode, the driver can also make use of assistance windows. In addition, the High Guiding function with integrated lane recommendation transfers detailed views from the screen directly to the instrument cluster or, optionally, to the BMW Head-Up Display. The BMW brand's large Coupe once again embodies the essence of dynamic capability and exclusive driving pleasure in a stylish and luxurious two-door design. The new BMW 6-Series Coupe represents the latest chapter in a story which now stretches back more than 70 years, a heritage enriched by legendary motor racing glories and numerous icons of automotive design. The unmistakable characteristics which marked out the BMW 327, BMW 503, BMW 3200 CS, BMW 2000 CS and the large Coupes based on the BMW 3.0 CSi - and whichsince 1976 have been perpetuated by the BMW 6-Series models - can now be enjoyed once again in a fresh interpretation inspired by the future. And so the new BMW 6-Series Coupe reprises the role of trailblazer in terms of aesthetics, dynamics and innovative technology, and provides the perfect next instalment in the tradition of inspirational dream cars from BMW. The new BMW 6-Series Coupe will be built alongside the new BMW 6-Series Convertible at BMW's Dingolfing plant. The BMW Group's largest production plant also produces the BMW 7-Series and BMW 5-Series. The flexible and efficient manufacturing processes at the plant combine state-of-the-art production technology with a quality standard underpinned by unbeatable precision craftsmanship in the construction of customer-configured premium cars.